When speaking about civil society, it is important to mention the people who help forge this environment in Armenia today. 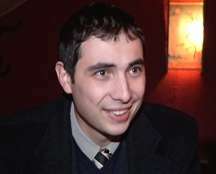 One such individual is Sergey Sargsyan, co-host of the ArmComedy Project (the Armenian version of The Daily Show) and a contributor on the Abovyan Group. You can watch an English edition of ArmComedy from 2011 on YouTube here. In an exclusive interview, Sergey speaks about the role and importance of political satire and its necessity of being a part of a healthy civil society. Q: You were born in Tbilisi, but you now live in Yerevan. How was this experience? How did this impact your style of comedy? A: Yes, moving from one environment to another is very helpful. It helps to understand people’s nature. That means you meet different mentalities, compare them and this forms contrasts. In between Georgia and Armenia, I also lived in Russia for a year and half. It was an interesting experience as well. Consequently, all this affected me. It helped me in forming an observational humor, which observes people’s characteristics. Q: Were you influenced at all by the great Soviet comedies, like Kidnapping, Caucasian Style (Кавказская пленница), Mimino (Мимино), The Diamond Arm (Бриллиантовая рука), and The Irony of Fate (Ирония судьбы)? A: Yes, I loved these movies very much, but the Soviet humor seemed too static to me. After discovering American humor, my outlook on comedy changed completely. The American humor was so wild, so instinctive, so open. By contrast, Soviet humor was very nice and positive but the limits were too noticeable. A: There is this concept of the “class clown” in America. In other words, in school, there is always someone who does humor in the class. I had this impulse, the impulse to joke about everything. I was that clown in my class. You know, there was someone who was good at math or at one subject or another. However, I wanted always to be the clown, the center of attention. I wanted everyone to laugh at me. It was a way to attract a social audience. Q: What is the role of political humor in civil society? A: The role is big. Political humor is a powerful instrument that can be used in several ways. It can restrain abuses and arbitrariness and implement a civil control. In other words, to make the authorities accountable for themselves. For instance, the police now try to justify all of their actions, try to explain each of their deeds. They’re now always under pressure. This wasn’t the same before and we have civil society to thank for this. Q: There is much sadness in Armenian history, so much so that there is a stereotype that Armenians are a dour people. Do you think that this is true? A: There is a such impression and it’s a bad impression. Armenia has many sad national holidays but there are very few where you see people actually go out onto the streets and celebrate with great exultation and happiness. It’s exactly this problem that I try to solve. Even in very sad situations, I try to find something positive. Otherwise it’s easy to give in and say everything is bad. Q: How has your comedy been received in Armenia? A: It works out good in narrow frameworks. However, sometimes I have to I get out of these frameworks to wider circles. I have to try and simplify my humor to make it more accessible to the public, which I don’t like. But sometimes I need to do this. Q: Have you ever gotten in trouble for making fun of a given politician or individual? A: I never exclude that there can be some consequences. I can be misunderstood. I never had a direct problem, but there have been some reactions from people who were offended. However, I try to speak about a person in a way not to offend him but to make him laugh. Sometimes people just do not accept my humor. Q: Do you think that your work can set an example for comedians elsewhere in the Caucasus? A: There is a such project in Georgia. They do political humor as well. In neighboring Azerbaijan, of course, there is no political humor. There were even some guys who tried to do something like this on YouTube and they were arrested. I don’t think there is political humor in Iran and Turkey too. The political humor can be very useful if the government has reached this level, I mean it allows the political humor to exist. Rather, the internet has reached this level. As long as the internet exists, it makes no sense to ban TV programs. It’s strange but the contact between Armenia and Georgia is too small in the aspect of culture. We get some responses only the from Armenian community of Georgia, even from Javakhk. Q: Do you see a link between your humor and Soviet-era dissident political humor, such as Radio Yerevan? A: In 2009, when we first created our website, there was much fear. We were concerned because we started our project with criticism. There was a dissident atmosphere. From this point, we can see the parallels between our humor and Soviet dissident political humor. However, today everybody tries to criticize, it has become a mainstream. Now we aren’t considered as dissidents, because everybody criticizes. Q: What do you think of Leonid Yengibaryan (Yengibarov)? Has he influenced your humor? A: I know him as a great figure of great humor. I was very impressed with his achievements when I studied his life. He got a great award in Prague, which was very exciting. I act in another genre of comedy but his successes were inspiring for me. Q: What do you think of American comedians? Are you influenced at all by The Daily Show, The Colbert Report, or Saturday Night Live? A: American humor became revolutionary for me when my American boss gave me a CD of George Carlin stand-up in 2006. It was a shock and a cold shower for me and at the same time crucial. I figured out that that was what I wanted to do. I know all the listed shows, I watch them. This style of humor is the closest to me. Our project ArmComedy was created under the influence of The Daily Show. Q: What is the most difficult part about being a comedian, specifically a comedian in a post-Soviet republic like Armenia? A: To explain to the authorities that political humor is a part of a normal, healthy life. Nobody should be offended. There has been political humor in the USA for a long time. But in Armenia, it’s a totally new phenomenon. Aside from amusing people, we also have to explain why they should have fun. Q: What is the best part about being a comedian, specifically a comedian in a post-Soviet republic like Armenia? A: There are advantages too. It’s a pleasure to start something from zero. Also sometimes there are shocking moments that people don’t expect. Exposing people to a pleasant shock is a pleasure too. Besides, I deal with my favorite activity. Making people laugh, even if it’s just a little, is a psychological need for comedians. I seek to satisfy this need.